So I started this new thing last week. You may have heard of it. It's called "cleaning." It's where you pick things up and put them away. And wash stuff. Like every load of laundry that ever existed. As it turns out... I *DO* have a floor in my laundry room. And my children actually own socks. And my favorite jeans? They totally exist. Who knew? But the very best part of this whole "cleaning" thing is that I finally achieved Laundry Level:NINJA!!! I picked up an ENTIRE load of laundry in one armful without dropping a single item. I mean, I've heard of it...but I've never seen it. And now it's happened to me. I'm the luckiest girl in all the land!! And I'm also pretty sure that it comes with a prize of no laundry for a week. Or a month. I get them confused sometimes.....basically, I've got plenty of time for cookies now!! 1. Use medium consistency green icing and a #3 tip to outline and fill the top and bottom part of the hat. Leave a space for the black banding. 2. Use a #2 tip and medium consistency orange icing (I mix just a little brown into my orange icing to get this color.) to outline and fill the space for the beard. With light green icing, pipe one leg. Let dry for 15 minutes. 3. Pipe the second leg with the light green icing. Use skin color icing to fill in the face and pipe two dots for ears. 4. Use medium consistency white icing to outline and fill the shirt area. Use black icing to pipe one shoe. Let dry for 15 minutes. 5. This is the difficult step -- add a second shoe. And fill in the black banding on the hat. Then let the cookie dry for an hour so the white is really dry. 6. Pipe to skin colored dots for hands. Pipe a tiny little dot in the center of the face for the nose. Use the darker green icing to pipe 2 triangles for a vest. It's okay if they touch a little. Triangles are friends like that. 7. Add the finishing details in any order EXCEPT -- add the hat buckle AFTER the eyebrows. Trust me on this one. So -- 3 dots for buttons, eyes, eyebrows, hat buckle, blushing cheeks and devious little smile....and DONE! Want to see it in live action? I've got you covered there too! 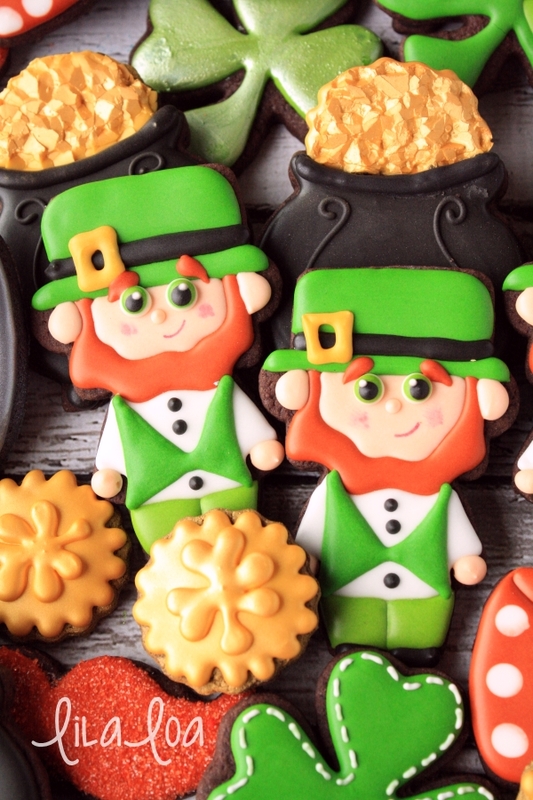 See how I made the POT OF GOLD COOKIES. 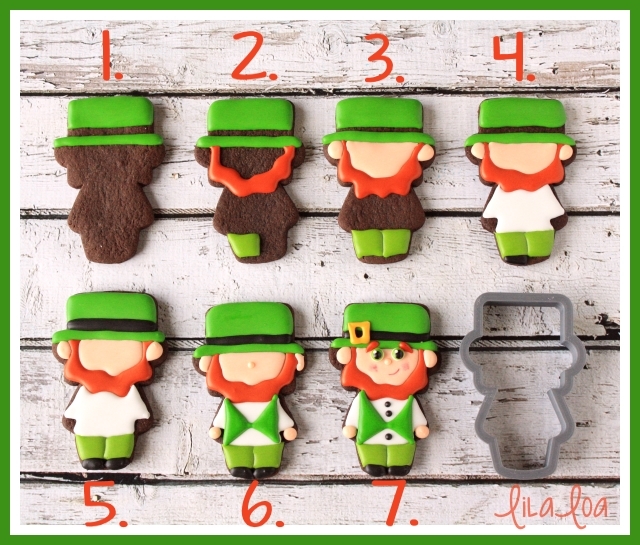 Make a leprechaun from a square plaque HERE. Make adorable googly eye shamrocks HERE. 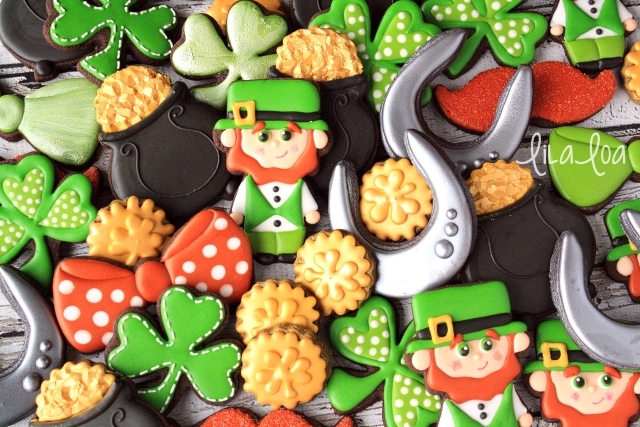 Put a rainbow and pot of gold ON your shamrock HERE.